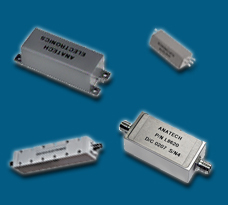 Anatech Electronics has a full line of standard Low pass filters already designed to meet previous customer's requirements. The fact that our products are manufactured by Anatech Electronics, gives us the flexibility to modify electrically or mechanically any electrical parameters, or mechanical style to match and fit that specific requirement. The designs already exist leading to more flexibility if indeed there is a need to modify a standard low pass filter. The low pass filters in our library can be requested, and ordered online. One should realize that the connectors when mechanically possible can be changed to other connectors. Cut-off frequencies can be shifted reasonably to match better the wanted cutoff frequency. All our Low pass filter can be built to meet stringent environmental condition, such as DO-160 , Mil-std 810, and others needed for the aerospace and military industry. Chances are that you will find the exact product match, or very close to it, knowing that Anatech Electronics can modify any parameter necessary to bring that product closer to the wanted specifications. Most or our Low pass filters are design in lumped elements, sometimes called Lumped Constant (LC) and distributed elements, or a mix of both. Our technical team will help you find that exact filters if you cannot find it, and when necessary will custom make that filter that will match your exact requirements.